1 x Mortar Sprayer. Due to light and screen setting difference, the color of the item may be slightly different from pictures. Suggested Air Compressor: 3 HP. Size: 210mm 225mm 670mm. USA, Canada, United Kingdom, Austrilia, France, Germany, Spain, Ireland, Italy, Others. Fit for Minimix 140, 150 mixers manufactured from April 2004 to April 2007. Model: MINI 150 140. Color: Body in black, Switch in red and green. 1 x On Off Switch. Size: approx. 52.8 29.5 53.2mm. USA, Canada, United Kingdom, Austrilia, France, Germany, Spain, Ireland, Italy, Others. Trending at C $8.68eBay determines this price through a machine-learned model of the product's sale prices within the last 90 days. The new Wall Stucco Sprayer will spray mortar, plaster, small scale shotcrete, papercrete, earthen mixes and more. The hopper holds nearly one gallon of material and empties in about 7 seconds. It is a great stucco tool for plastering a stucco house and for traditional plastering such as one-coat or three-coat stucco, for GFRC, and stamped concrete. Model Trowel Masons. 1 x Trowel Masons. Toy & Hobbies. 1 x Abrasive Paper. Arrived Rate. United Kingdom. Load Power 1500W. United States. Model Trowel Masons. 1 x Trowel Masons. 1 x Sponge Trowelling Plate. 1 x Hard Trowelling Plate. 1 x Abrasive Paper. Arrived Rate. United Kingdom. Load Power 1500W. Model Trowel Masons. 1 x Trowel Masons. Toy & Hobbies. 1 x Sponge Trowelling Plate. 1 x Hard Trowelling Plate. 1 x Abrasive Paper. Arrived Rate. United Kingdom. 1100W Powerful Mixing Drill with a compact lightweight balanced design. Mixer drill(included) : 120(D)×570(L)mm. Model : EV42. Model Trowel Masons. 1 x Trowel Masons. Toy & Hobbies. Load Power 1500W. 1 x Sponge Trowelling Plate. 1 x Hard Trowelling Plate. Arrived Rate. United Kingdom. 5 Cubic Feet Wheel Barrow Mixer. 10" Hard Rubber Wheel Allow Mixer To Be Moved Even When Loaded. All-Steel Unit is Rugged Enough for Construction and Farm Use. High Torque Gear Transmission Drives Drum Rotates @ 23 RPM. 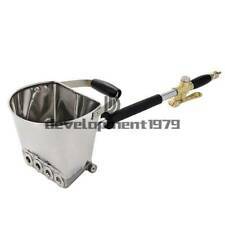 With stirring rod, can be converted into electric mixer. 1 x screwdriver. 1 x wrench. 1 x sponge paste tray. 1 x sponge wiper. 1 x stir bar. Handheld steering wheel handle for comfortable and stable use. From low viscosity paints to high viscosity mortars the BNR6400 power mixer get's your job done quicker, safer and easier than using a conventional 1/2” drill. BN Products Model No. Heavy Duty 1800W Mixer built for the tough jobs. Pneumatic plastering machine is made of aluminium, stainless steel (INOX), brass and polyamide. It is elaborated in every technical detail and endurance. Plastering machine is easy to disassemble for cleaning and maintenance. Featured a solid steel construction and 2 rubber wheels, this machine is easy to use and easily rolled nearly anywhere. Drum Capacity: 63 Liters/ 2 1/5 Cubic FT. Drum Speed: 27.5 RPM. Cable length: 63.0"/1.6M. Blastline's handheld mixers are a great tool for mixing paint, resins, chemicals, ink, adhesives & block fillers. This model includes a 1/2" capacity chuck. This model features a Gast air motor which is known for its rugged construction and reliability. Made in the USA, this high quality pneumatic hand tool is manufactured from the highest quality materials and designed with comfort and durability in mind. Keeping your tools clean is good practice for any professional. Smoothing effect is good. 1 x manual screwdriver. 1 x hex wrench. External carbon brush design. 2 x spare carbon brush. Self-adhesive disc design, can quickly change the wiper. 1 x hard wiper. 1 x sponge wiper. Motor power: 1680W. 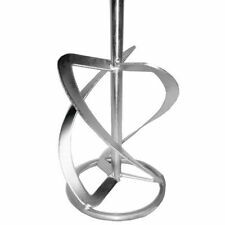 With stirring rod, can be converted into electric mixer. 1 x screwdriver. 1 x wrench. 1 x sponge paste tray. 1 x sponge wiper. 1 x stir bar. Handheld steering wheel handle for comfortable and stable use. Model: 0818. We also have mixing rods of different materials and lengths. Screw output : (14mm). No-load speed: no. 100-85 0r/min. Motor Power: 750w. Wipe weight: 900g. Collomix 17 Gallon TALL Bucket Collomix. - Heavy-Duty black polyethylene mixing tub. - Rugged Tough Tub for Mixing any job-site materials. 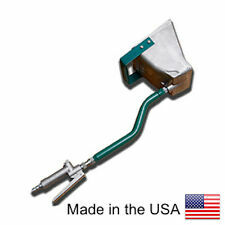 Dual Speed Paint Mortar Mud Groud Dry Wall Material Mixer up to 775 RPM Speed! 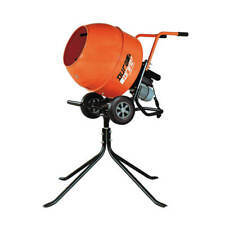 This mortar mixer quickly mixes batches of paint, drywall mud, grout and mortar hassle-free! The paint mixer features two variable speed ranges in order to mix a wide variety of materials. Dual Speed Paint and Mortar Mixer. Model: 0919. We also have mixing rods of different materials and lengths. Screw output :(14mm). No-load speed: no. 100-700r/min. Collomix 17 Gallon mixing bucket/tub. Plastic Concrete Mixing Bucket. Suitable for use with any of Collomix hand-held power mixers and specifically designed to work with Collomix stationary mixers. Collomix 17 Gallon mixing bucket/tub. Heavy-Duty black polyethylene mixing tub. XO1 COLLOMIX PROFESSIONAL HAND HELD POWER MIXER. Collomix hand-held mixers are used for small batch professional mixing of jobsite materials. These materials may include everything from paint and lacquers all the way up to complex materials such as Glass-Fibre reinforced concrete and everything in between. Industrial electric putty powder mixer, paint, paint, food, cement mixer Model: 0818 Product use: stirring Rated power: 1100W Voltage frequency: 220V 50/60hz No-load speed: no. 100-850r/min Screw output :(14mm) We also have mixing rods of different materials and lengths. If necessary, please contact us Note: Due to differences in light and screen, the color of the item may be slightly different from the picture. Due to the different angles of the photos, there may be visual differences. Due to manual measurements, differences of 1-3 cm are Allowed. Don't buy if you mind. Thank you. payment 1. We only accept PayPal. 2. The auction must be received within 7 working days after the auction ends. 3. When you pay for your order, leave a comment on your special request (such as color or s.
Fill the bucket with baton and point to the wall you want to stucco and open the valve. The gun will spray the material to the wall. With 4 spraying holes, made of stainless steel and zinc alloy handle, it is antiseptic, anti-rust and easy to clean. PART NUMBER 260945. HAS HELICAL CUT CAMSHAFT DRIVE GEAR. 5" x 5" blade. 28" hex shaft. Tall 5 Cubic Feet Mixer. 10" Hard Rubber Wheel Allow Mixer To Be Moved Even When Loaded. High Torque Gear Transmission Drives Drum Rotates @ 23 RPM. Over All Dim: 25"L x 29"W x 55"H.
Drum Capacity: 120 Liter. Drum Size: 27"W x 12-1/2"D. Drum Speed: 32R/MIN. Power: 1600 Watts. PART NUMBER 261521. HAS HELICAL CUT CAMSHAFT DRIVE GEAR. FITS 10hp. CAST IRON HORIZONTAL SHAFT GEAR REDUCTION ENGINES. The mixer is an electrical power mixer, which fitted with double count-rotating mixing tool. Electrical Power Mixer. 1600W Electric Hand Mixer. Xo4 Collomix Professional Two-Gear Power Mixer. Xo6 Collomix Heavy Duty 2 Gear Power Mixer. XO6 COLLOMIX HEAVY DUTY 2 GEAR POWER MIXER. ·for high viscosities, heavy and sticky materials, like mortar, plaster, concrete, screed, quartz-filled materials, etc. Power mixer Xo 6. Collomix hand-held mixers are used for large batch professional mixing of jobsite materials. 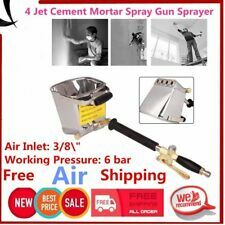 Air Powered Stucco Mortar Plastering Sprayer Hopper Gun. Fibered stucco. Great for spraying Chopped Straw(soaked). Earthen Mixes. When you have a construction project to do, its important to have a reliable concrete mixer with enough drum capacity to handle the job. Whether youre working with quick- or slow-drying materials, the right mortar mixer can make a big difference in the quality of the finished product. When choosing a mixer, you should know how to use and maintain the wheel, drum, and other components to keep them in good condition for their entire lifespan. What materials can be prepared in a concrete mixer? What drum sizes are available? Steel drum sizes range from around 2 cubic feet to more than 5 cubic feet. The capacity of a mortar mixer is typically about half the volume of the entire drum. Depending on the size and scope of your project, you should choose a product with enough capacity to keep your concrete or mortar wet for six to 12 hours a day. How do you clean and maintain a concrete mixer? Break down the mortar mixer by removing the drum and disassembling any mechanical parts. Wash the inside of the drum with water to remove any residual cement left over from the project. Spray off any cement stuck to the legs or sides of the mixer. Use a stiff-bristle brush to remove any dried cement or mortar from the exterior of the mixer. Let the mixer dry overnight and then reassemble the parts when theyre finished drying. How powerful are mortar mixers?